I love house parties. They’re one of my favourite events not only to organise but to be invited to as well. They have no ‘set expectations’, they can be themed and within reason you can make your own rules and do what you like when it’s your party! Singlehandedly my biggest recommendation for all house/private parties (and weddings, anniversaries, family parties, corporate events…) I can make…EVER. They completely change your experience on your big night, they remove any last minute stress you’ve got and they give you an opportunity to really enjoy whatever you’re celebrating for. Having bar trained waitresses gives you the freedom all evening to enjoy your friend’s company. How many gatherings have you had at home fetching everybody drinks and before you know it it’s time for everybody to go home and you’ve felt like you’ve not said hello to anybody? You’re not being the “host” and making drinks for everybody who arrives. Your guests’ expectation levels are raised when they see a proper bar area with trained people serving them drinks. You get to experience your big night just like your friends and family are. They give you the opportunity to catch up with friends & family you may not have seen for a while. You get to have good fun with everybody whilst being looked after by the trained waitresses yourself. They help prepare at the start of the night taking sure the bar is ready. The ice is sorted, limes are all chopped up and glasses & bottles are where they should be. During the event they help tidy glasses up and make the tidy up at the end of the evening that whole lot easier. I’ve had customers tell me it’s the best £250 they’ve spent – it’s allowed them to enjoy their evening as if they were a guests of their own party. I can’t recommend them enough! One of my most common questions I get asked when organising a house party is how do I protect my carpets? Even if the plan is to keep everybody “out” in the marquee, and you don’t quite fancy portable event loo’s outside then everyone’s going to need to use your toilet inside the house. If you’ve got light coloured carpets, and you’re concerned about spilled drinks etc then I’ve got the perfect solution! The plastic film protector is a clear film of plastic that has an adhesive on one side. It’s usually in a 25m roll for around a tenner which would cover a standard living room. Far cheaper than replacing your carpet after a bottle of jagermeisters got launched on it! It takes around 10 minutes to lay and gives you complete piece of mind you have a waterproof film over the carpets. Plus it means tidying up the next day has just got a lot easier. Peel the film off the floor and chuck it all in the bin and you’ve just tidied up before that bacon has been cooked whilst feeling a bit worse for wear. Genius! Here’s a link to what we recommend. Music is an integral part of any private party. It’s really easy to get it right. You’ve got two options – all depending on your budget. It’s that simple. A good DJ earns their crust by choosing the right songs to play at the right time. Our BBC Radio DJ’s spend time with you before your party making sure they have the right playlists in mind during the night. They’ll make sure they’re playing music you enjoy and get people up dancing and having a good time. Using something like Spotify with a speaker is all very well but having the ability of someone to merge songs together (without that awkward 7 second silence when the track changes) is what justifies the small expense of having a really good DJ at your party. Not only that but they come with good quality lighting systems alongside powerful, better quality speakers. Not only that most good DJ’s carry spares of everything – in case the unexpected happens. So if that speaker you borrowed from your mate up the road decides to give up the ghost halfway through Bohemian Rhapsody you’re knackered. A good DJ will have thought of issues like this before he turns up! Our BBC Radio DJ Gary who we highly recommend – also has a really cool gobo light which spells your name all over the dance floor…just to remind everybody who’s big night it is! In terms of costs expect to pay something around £300-£400 for a good quality DJ. You’ll get them for 4-5 hours of playing, and they’ll probably arrive an hour before your set time to set everything up. The better DJ’s may even arrive early afternoon or the day before to make sure their equipment is set up and ready to go so they are not interrupting the party itself by bringing in their masses of flight cases through! There are some out there who would do it for less than the above – but in the DJ world you really do get what you pay for. DIY – Speaker & Spotify! I understand everybody has a budget to stick to with their event. If you can’t quite justify a DJ experience then hiring a good quality speaker with a playlist from a service like Spotify or Apple Music will do the trick nicely (make sure you have the paid for version. Nobody needs to hear an advert break after two songs!). You won’t have the smoothness of transition of songs but at least these streaming services allows you to choose and set playlists allowing you to decide what comes on next. It will be fairly time consuming to complete this so set a few hours to make sure this is done right. Make sure you download the whole playlist to your phone first and then get your phone on airplane mode. It means you don’t get any text messages pinging though halfway through your chorus! Check there are no alarms that will go off halfway through the night too. I would also suggest to have this playlist downloaded on more than one device – just in case your phone decides to misbehave and turn itself off all of a sudden. We’ve got speakers you can hire from us from £78. They’re 1000w so you’ll need to tell the neighbours if you’re planning on having it on maximum volume and the quality of sound is second to none. This question is always quite a common one – how to know what and how much alcohol for everybody! I had a big birthday bash a few years ago (in a marquee of course). Planning what drinks to get and how much of it took me about an hour to work out – the simplest way to get this right is to make a spreadsheet of your guest list and to ‘second guess’ what they are going to drink for the night. Keep your bar options really tight and simple – offering too many options will end up costing you money in half opened bottled of spirits you’ll never drink yourself afterwards. I always suggest to offer drinks in bottles for simplicity. Most men are more than happy drinking straight out of a bottle (saves hiring so many glasses) and there’s no washing up after – just a trip to the bottle bank in the morning. I would offer one bottle of lager, one red, and one white wine – perhaps some prosecco if your demographic on your spreadsheet is telling you you’ve got a load of prosecco drinkers. Don’t forget not everybody will drink so you’ll need some soft drinks too such as Coke, lemonade, tonic, water & orange juice. If you offer spirits it gets slightly more messy where you’ll need to arrange for ice and more glasses to be hired (we can arrange this for you). If you want to offer spirits, again, be very tight on what you offer. Perhaps a Vodka, Gin and something else. Don’t forget to get more soft drinks for the mixers. If you offer spirits I would almost DEFINITELY look at tip number one…waitresses! It’s a time consuming task making spirits and if it’s a free for all, your bar area is going to look like a bomb has hit it in no time. Not to mention every possible surface is covered in that sticky film that makes you feel sick the morning after. Waitresses take all of that hassle away. In regards to quantity of drinks – refer to your spreadsheet to give you an idea on how much of what to buy. Most supermarkets offer a sale or return basis – so as long as the crates/bottles are unopened then you can send any unused items back. Again, our waitresses are trained with this in mind and will only open another box when needed. To put into perspective I sent back £700 of alcohol back to a well known supermarket and they didn’t bat an eyelid. So go a bit mad if you’re worried you’re friends have a habit of drinking lots! Getting the layout of your marquee & house right ultimately depends on your needs and the existing layout of your house. You may want to keep everybody out of the house (18th birthdays!) so all amenities will need to be considered inside the marquee – bar area, dance floor, standing area, chill out are etc – perhaps with some portable event loo’s outside too. This means you could effectively lock your doors to your house as they is no need for anyone to go back inside! It also means you’ll need a larger marquee to fit everything in to. (Take a look at our other post in working out what size marquee will be right for you). For some, having a marquee is a simple extension to the house. The downstairs living areas of your house is most likely going to be your bar area and social standing area. You can then turn the marquee thats attached over your outside doors as your dancing & music area. We can turn it into a nightclub atmosphere if you wish with LED lighting, sound equipment and dance floors really setting the scene with what vibe you want to give. It doesn’t stop there though. 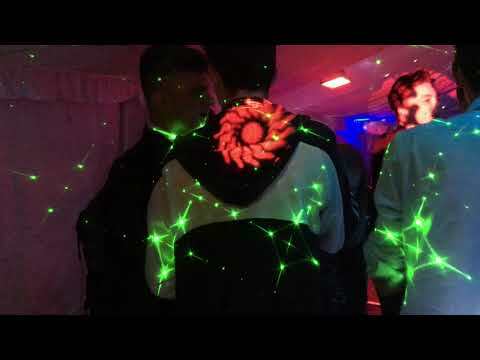 Adding LED uplighting around your house also creates an awesome party atmosphere and tells your guests as soon as they arrive they’ve found the right place!